to see multiple shows and to experience what it would have felt like to live in a castle and how they evolved from the motte and bailey to the stone keep. Once we arrived we went to watch a real trebuchet being fired! During this display, there was also a live explanation on how trebuchets worked and why they operated in the way they did. We watched the trebuchet fire a boulder into a nearby field whilst some of us captured it in slow motion on camera. After this, we went to watch the Bird of Prey display where a man explained how the birds are trained and information about breeding. We saw three different birds, all trained within the grounds of Warwick Castle. castle before heading down to the bailey. The bailey contained multiple merchandise and food stalls, which we got to explore afterwards, but before this we went on a tour around a section of the castle. We explored the rooms which were decorated in the styles of different historical periods. 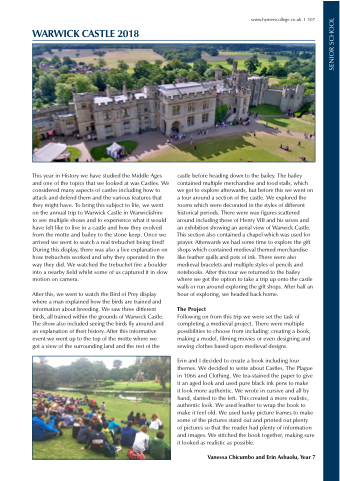 There were wax figures scattered around including those of Henry VIII and his wives and an exhibition showing an aerial view of Warwick Castle. This section also contained a chapel which was used for prayer. Afterwards we had some time to explore the gift shops which contained medieval themed merchandise like feather quills and pots of ink. There were also medieval bracelets and multiple styles of pencils and notebooks. After this tour we returned to the bailey where we got the option to take a trip up onto the castle walls or run around exploring the gift shops. After half an hour of exploring, we headed back home. Following on from this trip we were set the task of completing a medieval project. There were multiple possibilities to choose from including: creating a book, making a model, filming movies or even designing and sewing clothes based upon medieval designs. of pictures so that the reader had plenty of information and images. We stitched the book together, making sure it looked as realistic as possible.